YOUR MAMA'S NOTES: Mel Gibson's Malibu estate, with its quirky stone, brick, stucco and wood-clad manor house, has come up for sale at $17.5 million. Sequestered behind an electronic driveway gate and a dense wall of trees and foliage, the 5.49-acre spread was acquired by the occasionally controversial, two-time Oscar-winning actor and filmmaker in July 2008 for $11.5 million, per Trulia, from then married but since divorced actors David Duchovny and Téa Leoni. A long driveway, which looks in listing photographs like it could use resurfacing, swoops down from the road and passes closely along the front of the house as it makes its way to a motor court and detached garage topped by guest or staff quarters. 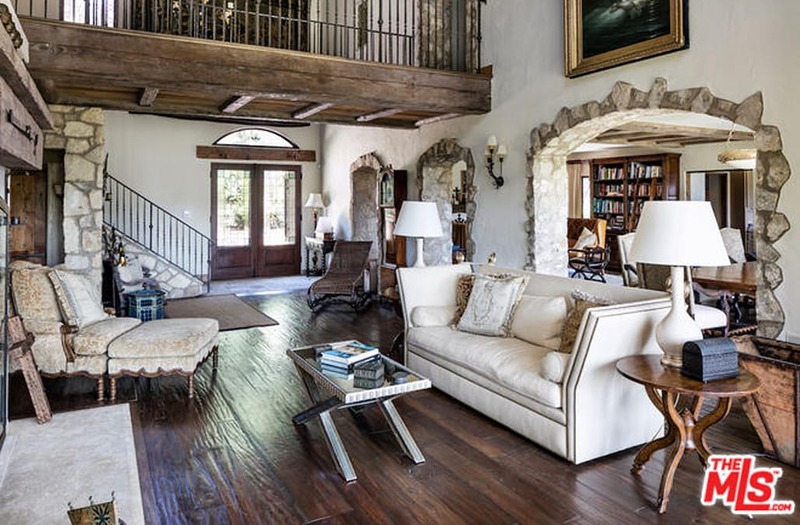 The 6,578-square-foot residence, built in the mid-1990s with five bedrooms and 4.5 bathrooms, is chock-a-block with authentic and/or authentically recreated Old World architectural details along with a truckload or two of religious artwork and ephemera. Wood and glass front doors open abruptly and informally into a baronial living room that features a double-height exposed beam ceiling, stone-faced archways, a bank of windows with diamond pane leaded glass and a massive fireplace laden with carved wood crosses and rosary beads. The neighboring dining room adjoins a library/lounge with built-in bookcases and a fireplace while a wood-paneled den/family room is anchored by a hulking rough-stone fireplace and opens though multiple sets of French doors to a grassy yard with canyon view. At least two of the bedrooms have stone fireplaces and large en suite bathrooms and one has a built-in window seat with leather upholstered cushions and French doors to a screened porch with a rustic mix of stone and reclaimed wood walls. A partly awning-shaded, dining terrace and a slender strip of lawn at the back of the house lead to a meandering, "magically lit" path that winds through the trees to a multi-level terrace nestled into the rugged hillside with not just one but two swimming pools, one of them a full regulation lap pool, plus a free-standing spa and a poolside cottage that houses fitness equipment. The property transfers with rights to the exclusive, members only La Costa Beach and Tennis Club where the membership fee runs about $100,000 with an additional $670 in annual dues. Mister Gibson previously owned a handful of multimillion dollar homes in Malibu, several of them right on the beach and another in the guard-gated Serra Retreat that was granted to his ex-wife in their divorce. He also used to own a roughly 45,000-acre cattle ranch in Montana, sold in 2005 for an undisclosed amount, as well as a spectacular, 15,862-square-foot Elizabethan Tudor mansion on more than 75 prime acres in Greenwich, CT, that he picked up in 1994 for $9.25 million and sold in 2010 for $23.875 million. His current holdings include several properties in the mountains between Malibu and Agoura Hills, one of which includes the Church of the Holy Family, a private traditionalist Catholic chapel built and funded by Mister Gibson. He also continues to own Mago Island, an almost entirely undeveloped island of roughly 8.5-square-miles in Fiji that was purchased in 2005 for a reported $15 million, as well as Hacienda Dorada, a 403-acre ocean-front spread along the unspoiled Playa Barrigona in Costa Rica'c Guanacaste province that was scooped up in 2007 for a reported $28.5 million and is currently on the market at $29.75 million, down from its original, 2010 asking price of $35 million.